Do you need school chartered buses that are School Pupil (SPAB) Certified? SLO Safe Ride drivers and our vehicles are SPAB certified by the California Highway Patrol. Grad Nights, Field Trip Charter Buses & More! 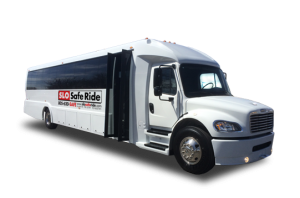 SLO Safe Ride has worked with various K-12 schools on the Central Coast to provide SPAB transportation for field trips, graduation nights, and prom nights! Our fleet of vehicles can provide comfort and safety while traveling, no matter the occasion. Previous field trips include transportation to Sequoia National Park, Yosemite National Park, Monterey Bay, and more! We have the best available vehicle to suit your needs – whether it is a midsize cutaway bus, or 56-passenger luxury coach! If you’re looking for transportation for your students’ prom night, inquire about our stretch limousines and luxury limousine bus, to make it a night to remember! 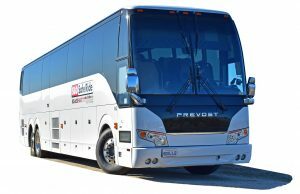 We provide sports team and club transportation for Allan Hancock and Cuesta College, and are available to transport to and from any college in the state. Fans, family, friends, and of course – the team – are welcome to hop aboard! Whether you need one bus or fifty, our knowledgeable team of logistics coordinators will get you what you need! School Pupil Activity Bus (SPAB) are commercial buses hired to transport students, that are outside of typical school buses. Commercial charter companies transporting for SPAB must adhere to stricter regulations, including certifying vehicles, drivers, and any other equipment by the California Highway Patrol. SPAB certification is required for any school-related function within the grades of Kindergarten – 12th grade, including grad nights, senior trips, homecoming and prom transportation. 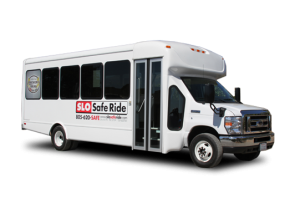 Whether you’re looking for a ride to the big game or booking for an all-day field trip, SLO Safe Ride can meet all your SPAB transportation needs.